This is a simple tip, but one which uncovers that which Microsoft’s Report Builder 3.0 hides in plain sight. It took me forever to figure out. Here are some screen shots, so that web searchers of the future won’t have to take so long. 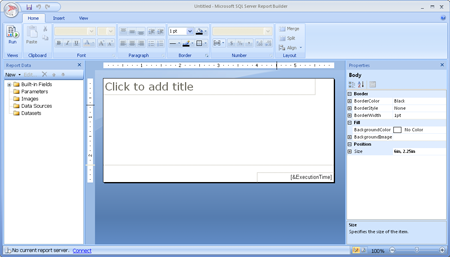 Report Builder 3.0 is an application which lets you design reports for use with Microsoft’s SQL Server Reporting Services 2012 (SSRS). One of my clients has me using SSRS to generate reports, which are formatted as PDF files. Obviously this requires a pagination process: laying out report content into PDF pages of specified sizes, and keeping specified margins of blank space around the page’s edge. Great! I clearly wanted to find the TopMargin and BottomMargin properties in the Properties pane. I could see the Properties pane easily (see the first screen shot, click for a full-sized rendition). But I couldn’t find any PageSize or Margin properties. Next, I looked for a way to bring up the Report Properties dialog box. I expected this to be on the Tools or Format or File menu of a Windows app. But Report Builder 3.0 is built with a new UI design, which lacked the traditional Windows menu bar. So, for a long time I was stuck. I couldn’t find how to make report-level properties like PageSize or Margin appear in the Properties pane. And I couldn’t find the Report Properties dialog box. Nor could I find documentation on how to do these things, just documentation that assumed I could do it. I was stuck for a couple of weeks, living with unsatisfactory margins, and getting other things done. Until I discovered the trick. Simply put, the trick is to click outside the report body. The second screen shot adds annotations, showing important parts of the Report Builder 3.0 window. A is the report body, an obvious place to click, and not helpful for finding Report Properties and PageSize properties. 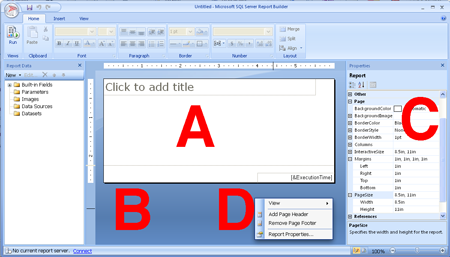 the Properties Pane, marked as C.
D shows the pop-up menu which appears when you right-click on the design surface; select Report Properties… from this menu to bring up the Report Properties dialog box. I achieved my goal, making the report margins smaller, by clicking at B. The Margins parameter set appeared in the Properties pane. From there, it was easy to adjust the value of the Top and Bottom Margins parameters. And now I’ve published this robobait, in hopes of seeding search engines with notes of this trick, and helping others get unstuck faster. Please let me know in the comments if this was useful.